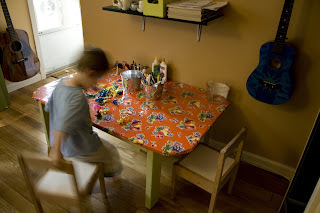 My kids needed a new art and crafts table. They have outgrown their small ikea table that barely can hold one kid's art. I was waiting to see a deal on craigslist and then one day I passed this table on the side of the road. I new with a cosmetic facelift it could work for my boys, so I rescued it from the trash. 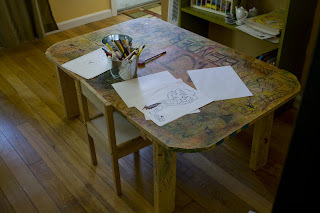 It's an art table afterall, it's going to get painted on and glue spilled on so why spend a ton of money on a piece of furniture that is just going to get messy. As it should. Now with a little paint and an oilcloth cover the boys have plenty of room to create their latest materpiece or have a dinosaur war where the dog won't eat the pieces. Wow, that really turned out nice.